Suisha House is perhaps a perfect destination for theatregoers looking for Japanese food before their play. It’s located just a few blocks from Redwood City’s two premiere theatres, and despite its intimate space, the restaurant always seems to have an open table or two for dinner. Sporting a menu of both sushi and Japanese comfort food at inexpensive prices, Suisha’s a great place to grab a bite to eat before your show. There are a number of appetizers to choose from, including gyoza ($5.95), a Japanese pot sticker filled with either pork or vegetables. The gyoza, which are also available as a free side along certain dishes, are crisp and bursting with flavor, without being greasy or overwhelming the flavor of your entrée. They’re so addictive, you might regret only ordering one set of six. Of note on Suisha House’s menu is its selection of udon noodle dishes. I’m personally more of a fan of the thick udon noodle than its more popular cousin ramen, and Suisha does udon justice. The most luxurious choice is the nabeyaki udon ($11.50), a rich mix of ingredients including chicken, shrimp tempura, vegetables, and a fried egg, a combination of flavors that becomes even more savory and complex as you eat it. Like many casual Japanese places, there are also combination meals ($14.95 for two options at dinner, $17.95 for three). These come with sides that include Suisha’s miso soup, which is slightly saltier and more savory than miso soups served at other restaurants – a good compliment to many of the combination choices, which trend towards sweeter flavors. Consider ordering the tonkatsu, a fried pork cutlet that comes with rich katsu sauce on the side, along with one of Suisha’s numerous sushi options. 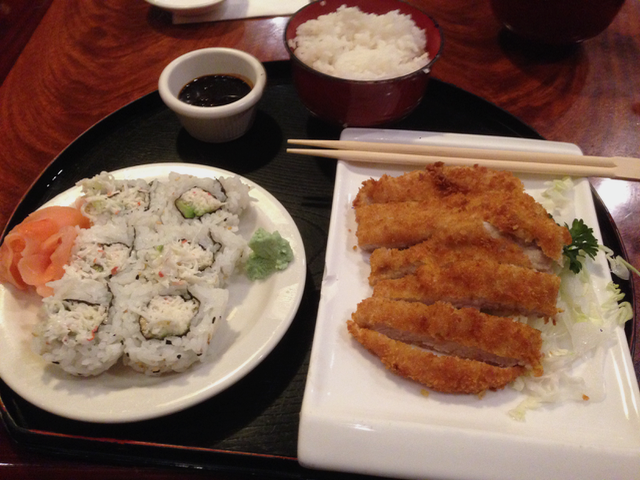 The milder sushi helps balance out the heavier flavors of the fried cutlet so neither overwhelms the palate. With a reasonable selection of tasty Japanese dishes, convenient location near two theatres, and friendly service, Suisha House is an excellent choice for a pre-show dinner. My favorite little touch is when they bring the check: Instead of a couple of wrapped hard candies, the waiter will serve a peeled orange with some toothpicks to round out your meal. It’s one of the cutest things I’ve seen from a restaurant in a long time.